The candidates appeared in a media presser one-by-one along with their running mates, after the forum, to answer additional questions posed by reporters. Pritzker, Biss and Kennedy continued to take shots at one another during the presser. Hardiman, Daiber and Marshall used the time to address issues such as waning media interest, campaign funding problems and a three-tiered campaign platform. “The bottom line is that, frankly, I did nothing wrong,” Pritzker said, regarding criticism of his relationship with Blagojevich, called into question following the release of an attack ad by Rauner’s campaign. Kennedy, son of the late U.S. Senator and Attorney General Robert Kennedy, challenged Mayor Rahm Emanuel to address city policies that are negatively affecting underserved neighborhoods. Biss, serving his seventh year in the Illinois General Assembly, agreed that the state government is dysfunctional and swapped barbs with Pritzker that gave them center stage. 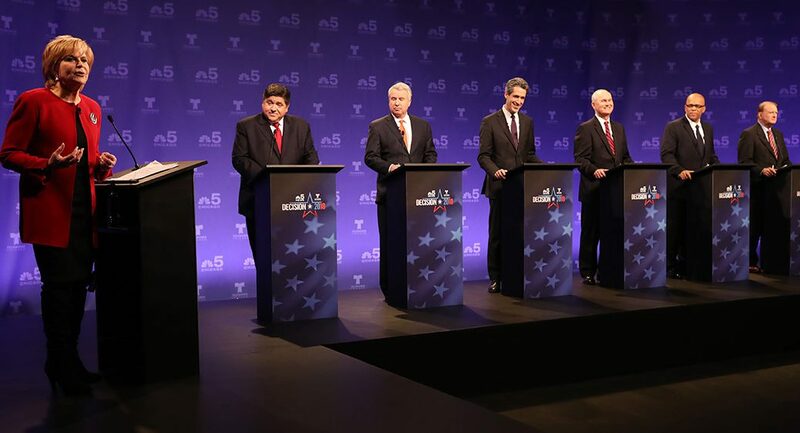 Five of the six candidates said they support replacing the flat 4.95 percent state income with a progressive or graduated tax that places wealthier taxpayers in a higher bracket than lower income people. “I think it’s hard to predict” but that the number would begin with a 5, Kennedy said when asked what the progressive tax rate would be and the state revenue it would yield. Both Biss and Pritzker claimed a progressive tax would adequately fund social services and education but were unable to state a specific figure. Biss cited the necessity for negotiations with members of the Illinois General Assembly before providing specifics. Hardiman said his 1-10 percent graduated income-based plan could bring in an additional $3 billion in revenue. “Taxes are too high already,” said Marshall, calling a graduated tax plan a disaster. Marshall, who wants to divide Illinois into three states, has run for numerous public offices on both Democratic and Republican tickets. “I understand Amazon is a once in a generation opportunity, but that’s no way to build an economy,” he said. He added that the best way to improve the state’s economy is to invest in higher education. Pritzker warned of a national “race to the bottom” when discussing the tax benefits cities offer to woo companies. But he expressed the pride he felt while helping to build Chicago into a tech hub. Biss signaled opposition to the Amazon headquarters, and cited the risk to local businesses as his motivation. “Illinois needs a vibrant entrepreneurial economy, and that means a governor who’s tough enough to sometimes say no, even if it’s going to cause a bad headline in the short term,” he said. Kennedy singled Pritzker out as a property tax manipulator, and called him the “poster child of pay-to-play politics,” with the removal of toilets as the basis of the argument. One of Pritzker’s Gold Coast homes was deemed uninhabitable and his lawyers convinced Cook County Assessor Joe Berrios to dramatically lower the home’s value, according to multiple media reports. This allowed the billionaire to save $230,000 in property taxes, according to the Chicago Sun-Times. Pritzker dodged a question related to the tax break and his relationship with Illinois House Speaker Mike Madigan, a property tax lawyer. Biss pointed out the billionaire’s unwillingness to answer the question and noted Pritzker’s relationship with Madigan as a liability in the race against Rauner. “It’s important to nominate someone with a record of standing up to Mike Madigan,” Biss said, referring to himself. Pritzker outlined Biss’ support of Madigan’s campaign for Speaker of the House as his rebuttal. “That’s the reason why people should vote for Tio Hardiman and Patricia Avery [for Lieutenant governor] because I have nothing to do with this mess,” said Hardiman. Photo at top: courtesy of NBC. Photos and audio from the presser (Elizabeth Beyer/MEDILL).